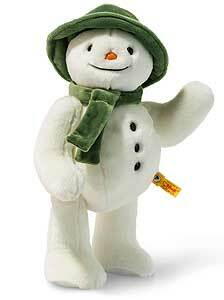 The Snowman by Steiff is made with dense soft plush. Soft, cuddly and complete with his tangerine nose, with the yellow ear tag and the trademark Button in Ear. A wonderful interpretation of the enchanting tale - The Snowman TM by Raymond Briggs.